The landscapes of France are incredibly diverse. Nature lovers, beach bums, bird watchers, hikers, and all types of travelers can lose themselves in what France has to offer. On my quest to see more of France, we decided to head south to a region we had never visited. 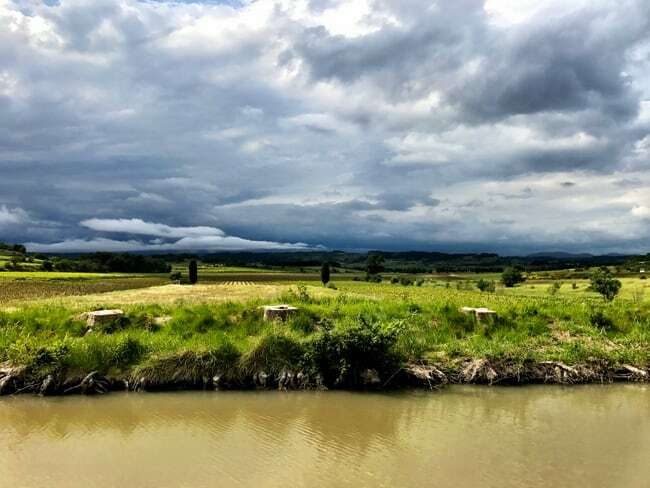 We invited my parents and in-laws on our second canal boating trip for a Canal du Midi cruise along the Mediterranean and the surrounding canals. Last time we went east to Alsace. 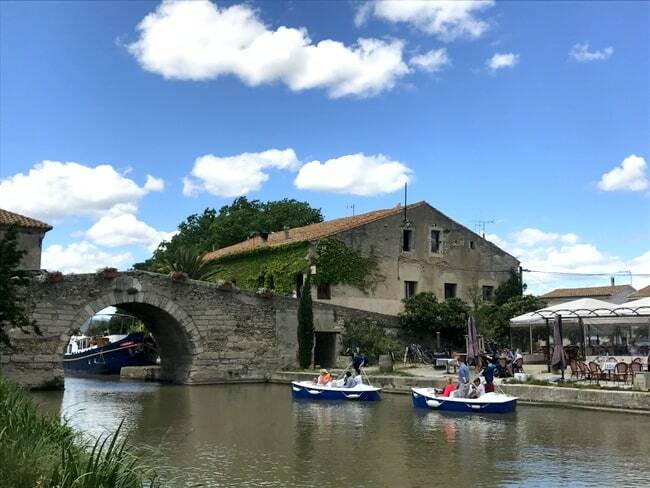 This time, we headed south to the Camargue, and from there, headed west ending up in the Canal du Midi aboard a Nicols canal boat. 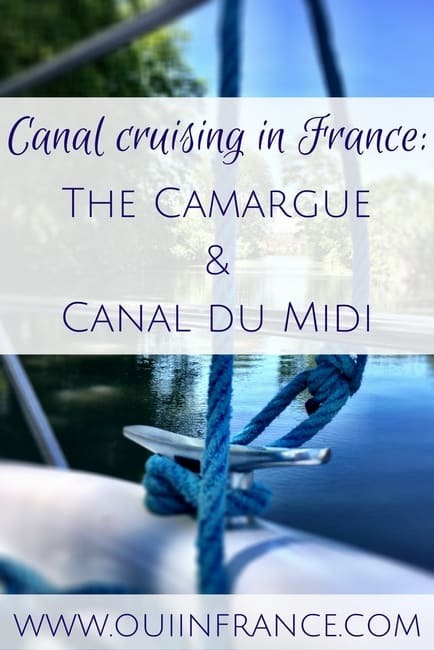 No special training or boating licenses are required making this sort of Canal du Midi cruise accessible to everyone who wants to experience France from the water. As expected, the French canal cruise trip was incredible! I’m going to be covering our trip in a series of posts because it’s way too much to write about in a single post. This first post will be the overview of our trip. As you might already know from my posts on social media, both of my parents were able to join us along with Tom’s parents, and of course, our dog, Dagny. The weather cooperated pretty much the whole trip with temps in the 70s the whole week (except for one afternoon very late in the day). The ports along the way were gorgeous and lively and we had no trouble stocking up on food every other day and getting fresh bread. I don’t know if it was the fact that the whole family was together or maybe that we lucked out with the weather, but the trip felt magical and the week on the water was a much-needed respite for all involved. As I mentioned, this was our second canal trip aboard a Nicols boat and I can’t say enough about how unique (and fun!) the concept is. Before Tom told me about this type of trip, I had no idea you could even do a self-drive French canal cruise! Coincidentally, Nicols is based not far from where we live, hence the reason why Tom knew a bit about them. The French company was founded in 1986 and quickly became known for their high-quality line of boats as well as their canal vacations. 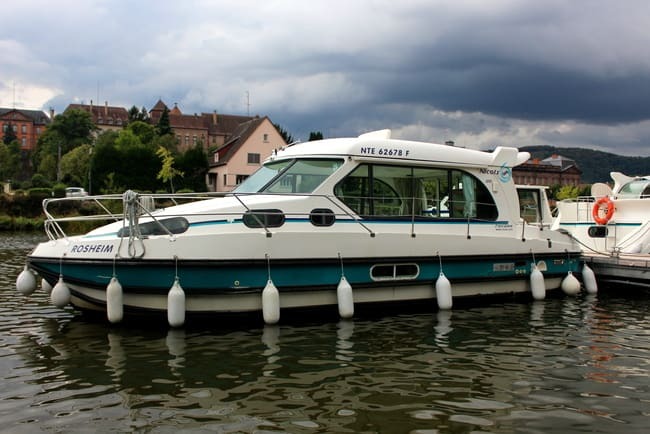 All of the boats are 100% made in France, and depending on the size, can accommodate 2-12 people. Nicols has 24 bases in France, Portugal and Germany providing a variety of Europe canal cruise experiences depending on what you’re after. You can rent a boat for the weekend, a week, or even two weeks! So what is the French canal cruise experience like? Simply put, the boat is your hotel and car for the week. You sleep, shower (in real showers! ), and cook on board and have a full kitchen with a stove/oven, sink, stand-up fridge and freezer and all the utensils and dishware you need. The boat is also what moves you down the canal. This post is titled “DIY Canal Cruise'” because you’re in control of where you stop and for how long. If you want to bypass a certain port, you can do that. Have friends near another port and want to stay 2 nights instead of 1? Not a problem at all. It’s your trip, so you can plan it out however you’d like. Just make sure you’re at the destination port when the trip is up. 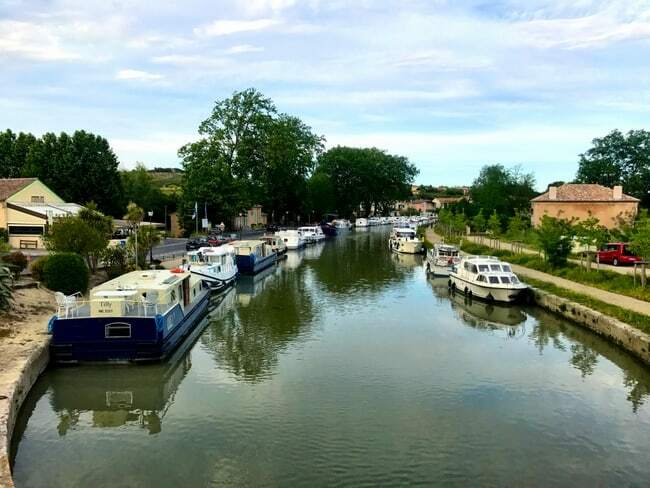 Keep in mind that Nicols boat rentals do not require a special boating license for a Canal du Midi cruise or in any of their locations, so anyone with a desire to do this kind of trip can rent a boat — no experience required! You’re the one to drive the boat, navigate, dock, etc. The boat’s max speed is 8 km/h, so everything is slow and controlled. It’s actually a lot easier for a newbie than it might seem. I was a tad apprehensive our first time, but my worries were unfounded. Nicols goes over boating maneuvers and safety procedures and makes sure you understand everything before you depart. I’ll be doing a post entirely on that topic, so stay tuned. Really, even if you have limited boating experience, you can do this. The boat we had was a Nicols Estivale Octo, which can sleep 8 people (although it’s more comfortable with just 6 and a dog). It had 4 cabins that each slept 2 people, 2 bathrooms with a regular toilet and shower, a well-equipped kitchen, and plenty of storage. Unlike the bathrooms on our last boat, this boat was a bit newer and had “real” showers with actual shower cabins. The doors closed and the removable shower head with good water pressure was a major plus. The bathrooms even had a towel rack that doubled as a towel warmer for chilly mornings! Nice touch, right? Even with 6 people who showered daily, washed dishes, used the toilet, etc., we didn’t have to replenish the boat’s water tank. Fuel lasts the entire trip as well so you don’t have to worry about stopping for gas. While cruising, there’s more than enough space for people to sit up front in the sun (see the little table? ), hang out in the back or even inside on one of the benches up near the captain. I purposely did not spend much time researching the destinations before our trip because I wanted to discover everything for the first time in real time. Aside from driving directions and a quick look at the map, I kept my googling to a minimum. Sometimes expectations get in the way after you’ve read articles about places and viewed others’ photos on Instagram. I knew a little bit about where we were going, but I saw everything for the first time with my own eyes in person — and I’m so glad I approached the trip this way. Beautifully blooming flowers and brightly colored houses greeted us at almost every stop and vineyards stretched for as far as we could see. Restaurants along the canal all boasted locally sourced menus, not to mention fresh fruit and bread were easy to come by. While docked, we walked around the towns, did a couple of wine tastings, visited local markets and shops, dined at waterfront restaurants, and thoroughly enjoyed our new surroundings. I even went jogging along the Canal du Midi, which has a nice footpath alongside it in many places. So where did we go on our Canal du Midi French canal cruise? Our one-way canal cruise started and ended on a Saturday. 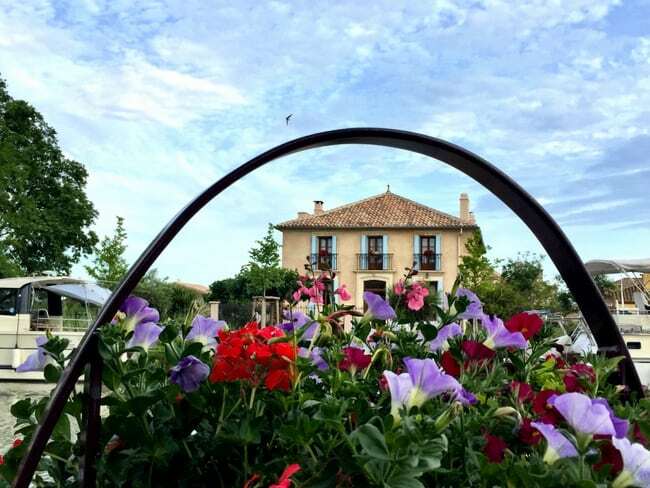 We started at the Nicols base in Aigues-Mortes, which is in the Camargue, and headed west over the course of the week to end up at another Nicols base in Le Somail, which is along the Canal du Midi. Level of difficulty: Easy route overall. We used the detailed guide to navigate. This route has lots of open space especially during the first half of the trip before you enter the Canal du Midi. There are minimal locks and they all had lock keepers to direct you. There were many areas to dock in nature and only moderately busy ports. Who are the other people on the canal? Many of your neighbors in port will be tourists just like you who have also rented a canal cruise boat for the week. Some people are on their own boats for months at a time discovering France and others are on day trips. There are also large chartered barges that you’ll see passing by. The majority of the people we met on the trip were European including German, Swedish, British, and of course French. Some boats can accommodate up to 12 people so you’ll see multi-generational family trips including young children, smaller boats with just a couple or two, girls’ or boys’ weekends, and more. Many people we saw cruising this time of year were of retired age but we encountered a fair share of younger folks on vacation as well. I’m going to write more specifically about the whole “no experience required” side of a French canal cruise since it’s the top question I’ve gotten and would love to answer any other questions you might have. 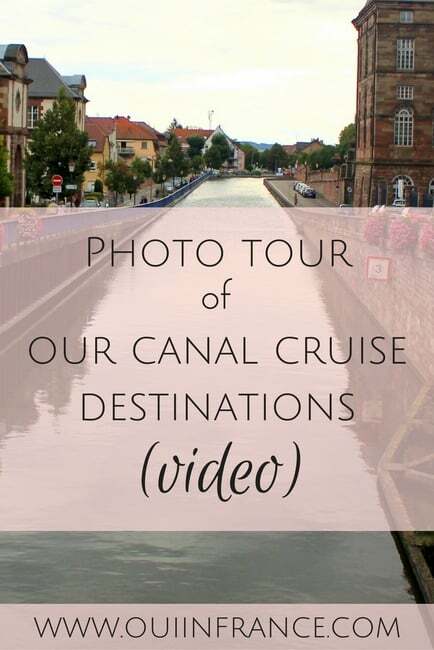 Please comment below or email me with any questions about canal cruising and I’ll cover them in an upcoming post! Have you visited the canals of France? Ever done a Canal du Midi cruise like this? Would you? Just beautiful Diane ! It’s just puts you there ! It’s just like a mini vacation from a far ! Thanks so much, Cynthia! 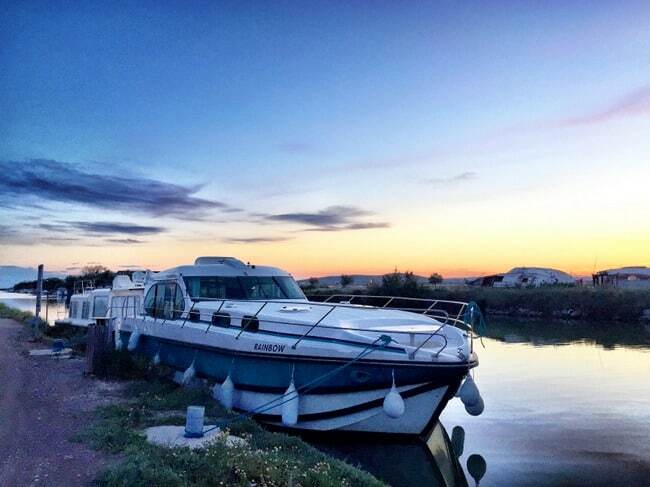 Have you ever visited the Camargue or Canal du Midi? You are so very welcome Diane ! No, I have never had the opportunity to do so ! I hope to someday when I can take the time off ! I wouldn’t want to rush through such beautiful places ! I would very much like to just take it all in and savor every moment ! It’s all so special and you can really feel the positive energy in those areas ! Enjoy this beautiful time ! I thought there was a footpath (originally a towpath) the entire length of the canal. Great for biking–it’s flat! One thing about the locks is to make sure you know what you’re doing with the ropes. A boat next to us got its rope caught and when the water went down in the lock, the boat started to tip over because it didn’t descend with the water and was tethered on one side. Some people came to the rescue and got the rope free before the passengers were dumped overboard–but it came close. Although I haven’t done a Canal du Midi cruise, I feel very lucky to have a house just outside Castelnaudary and a garden which backs directly onto the Canal towpath. Every time I go out of the garden gate, I feel privileged . That sounds beautiful! Such a great area. Does it super hot in the summer? Was mild when we were there, thankfully — I am not a fan of heat! Wow … what a unique idea for a trip and it sounds like there are many options. 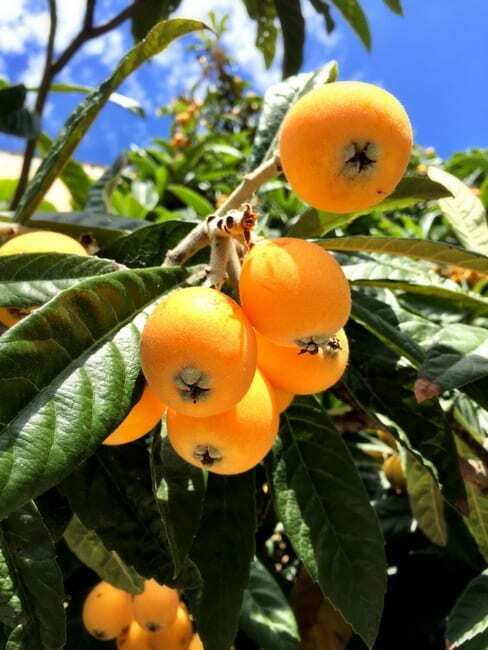 Great post Diane, and I love your photos as always. Looking forward to reading upcoming posts with additional details! Thank you! It’s really a stunning way to see France if you’re looking for something a little different. How beautiful! That looks like such a great way to explore and see more of the country. I read your posts on canal cruises with fond memories of ours. We cruised the Canal Lateral a la Loire years ago with my parents and 2 sons. Our sons, ages 18 and 20 at the time were not as entertained as the adults. It was a little too far removed from any action for them! My parents and husband and myself enjoyed it immensely and still recount it. The leisurely pace, waking up to my husband starting the engine and coffee up top, getting bread and wine daily in a village, drinking wine by 1:00 as we cruised, chatting with fellow boaters, working the locks., riding bikes along the canal and my mom almost riding right in! Someday we wish to do it again as it was one of those “best trips ever”! Hoping you have another post of your trip! I loved all your Instagram photos from the trip! It looked so beautiful. This seems like a great way to take a family vacation – kind of like your own personal cruise. Thank you! All the places were so photogenic it was crazy. It’s exactly like a personal cruise, nice and low-key! C’ est vraiment très beau de naviguer sur le canal du Midi. Merci Diane de partager vos superbes photos de voyage. Hello, I have rented a boat already for 9-20th of October. (not with Nicols -Sorry- if you feel you need to erase this post do it please). Our point of departure and return is Port Cassafieres, and for the 11 day boat cruise we are not sure wether to go East or West. This is our first time cruise and are only 2 (my wife and I) + our 2 dogs. Would you recommend to go better east or west. 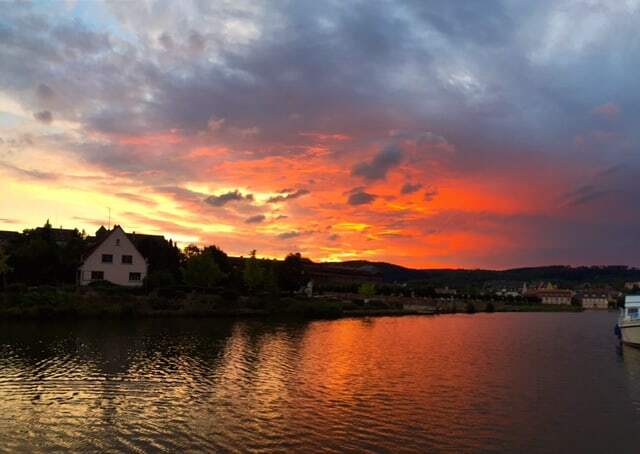 By the way- I just looooved your cruise on the Alsace- I am fixed to do it in 2018 if we enjoy our experience this year in Canal du Midi, as we love wooded áreas and green nature in general. Hi Jose, that sounds great! Of course I wouldn’t delete your post because you didn’t book with Nicols. No problem at all. So about you question, it’s so hard to tell you which way to go because there are great places east and west of where you’re starting. Le Somail and Capestang are gorgeous (west of your start) but the area east will show you more open water and there are fewer locks. If you’re going for 11 days, maybe you can map out how much ground you can cover and start by heading east all the way to Aigues-Mortes and then come back west and try to get as far as Le Somail. 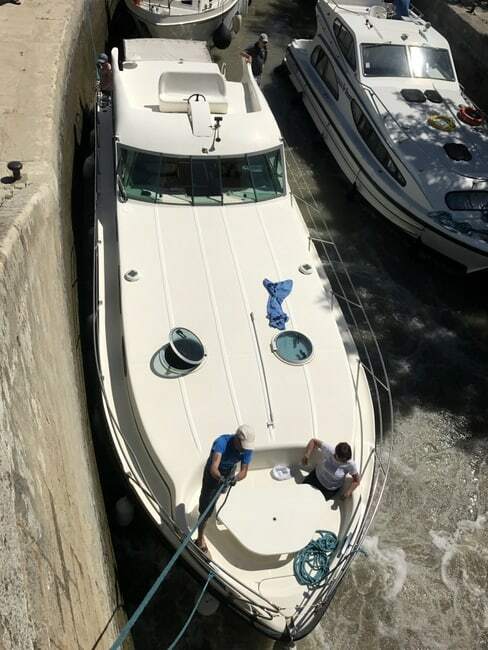 I don’t know if it’s doable with the boat you have, but if I were to do it again, I’d try to stop in Aigues-Mortes, Sete (we didn’t last time because of bridge times that didn’t work with our schedule), and Capestang for sure. Try to map it out and do the math and see how much ground you can cover! 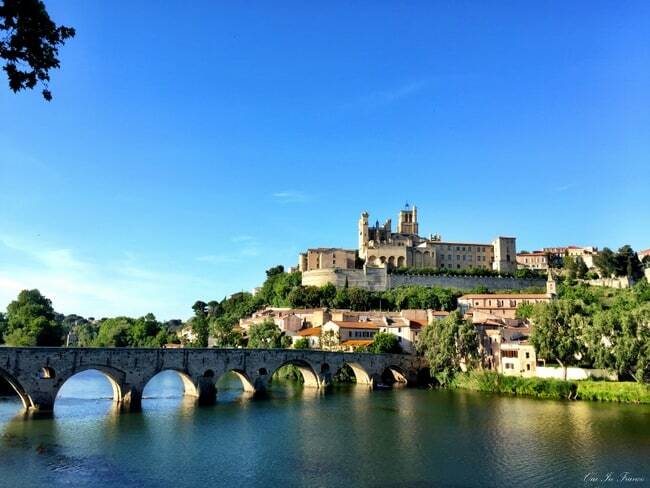 Beziers wasn’t our favorite and nor was Palavas-les-Flots. So happy you liked the Alsace coverage as well! Totally different type of scenery and overall experience but just as rewarding and gorgeous! Feel free to email me if you have more specific questions! Enjoy your trip!